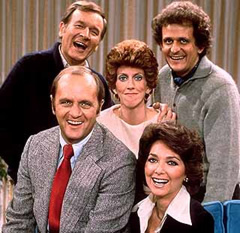 Performers include: Bob Newhart, Peter Bonerz, Suzanne Pleshette, Bill Daily, Marcia Wallace, Jack Riley, Florida Friebus, and Renee Lippin. A sitcom about Chicago psychologist Robert “Bob” Hartley (Bob Newhart) and his beautiful wife Emily (Suzanne Pleshette). They’re frequently interrupted by their dim-witted airline navigator friend and neighbor, Howard Borden (Bill Daily). At work, Bob shares the services of witty receptionist Carol Kester (Marcia Wallace) with orthodontist Jerry Robinson (Peter Bonerz) and other professionals on the same floor. Bob’s patients are a crazy bunch of characters including mean-spirited Elliot Carlin (Jack Riley), milquetoast Emil Peterson (John Fiedler), whiney Michelle Nardo (Renee Lippin), nasty Mr. Vickers (Lucien Scott), and overly kind Mrs. Bakerman (Florida Friebus). Bob takes a job teaching psychology at a small college in Oregon. After a going-away party and a tearful farewell, the Hartleys move away to start a new life. While the credits roll, we see the cast taking their final bows and thanking the audience for six years of support. First aired: April 1, 1978. Characters from the series have popped up in a number of places over the years, most memorably in the final episode of Newhart. You can read all about them in this article. • Bill Quinn, who plays Dr. James Wyler in the final episode, is Newhart’s father-in-law. The episode was directed by Bonerz and director/writer Michael Zinberg. Both have directed many other series. • After the 1982 Newhart sitcom premiered, Newhart told TV Guide, “At one time, I thought of simply picking up the old show four years later. I think it might have worked.” Though the series features new characters, the Vermont small town setting is very similar to what Oregon might have been. • During the series opening theme, we see Bob making his way through the streets of Chicago, home to Emily. Newhart’s daughter became sick during the filming of this footage so a double was used for the long shots. The series’ themesong is entitled Home to Emily. • Pleshette passed away on January 19, 2008 from resperatory failure. She had been married to Newhart star and Bob Newhart Show guest Tom Poston since 2001. He had passed away in 2007. TV Series That Were Only a Dream — The Best and Worst! This is the oldest of school. I’ll have to buy this whole series sometime in the near future.